Infodrive School of Motoring is a driving school based in Newham. The school provides driving lessons across East London and according to its website, it’s London’s most successful driving school. They provide both manual and automatic driving lessons, with the choice of either a male or a female driving instructor. Their website mentions it teaches over 300 students a week and has over 200 customer reviews. For an introduction to the driving school, you can watch their Facebook video below. Infodrive has very competitive introductory prices. They offer 5 lessons for £58 and this works out to be £11.60 an hour. This is a very good price and one of the cheapest we have found in East London, however the offer is only available to new customers who have not driven before. If the school feels you are too experienced, or you require less than 10 lessons, you will not be allowed to take up the offer. They also offer 10 lessons for £159.95 and again this great value, however it only applies to the first 10 lessons and does not apply to full license holders. Their website does not mention how much it will cost after the 10 lessons are completed. If you plan to book lessons with the company, call before and ask how much it will cost after the introductory offer is complete. Doing so will ensure there are no unexpected changes in price. Infodrive have a mixed set of reviews. Of their 52 reviews on yell.com, 12 of these have a 1 star rating. For a reputable company, that many 1 star reviews is a cause for concern. They do however fare better on Google. They have a 4.1 out of 5 rating based on 36 reviews and from the comments left on their page, Ash is a highly regarded driving instructor. If you would like to read reviews on their website, you can also visit the testimonial page. If you would prefer to get in touch via Facebook, they typically reply to messages within a day. Their Facebook page is liked by 702 people and they generally post pictures of recent passes and current offers. They also offer free theory test training if you book your driving lessons with them, however you will need to call the driving school for more details. To book a driving lesson with Infodrive, you can either call the number above, have Book Learn Pass book on your behalf, or fill in their online booking form. All payments are cash in hand, as they do not accept payment online. Infodrive were great at boosting my confidence and getting me ready for my driving test. I passed quite easily and I'm really thankful I choose them and in particular my driving instructor Ash. He's a great teacher and someone I would definitely recommend. 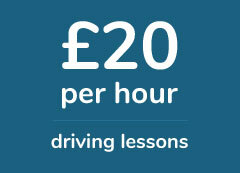 Great driving school, they know what they are doing and I really enjoyed my driving lessons. If i had to do it all over again, I would choose Infodrive.